Exclusive $75.00 rate for REPs registered exercise professionals. NZ Register of Exercise Professionals - REPs NZ REPs supporting students and graduates on their journey to our industry. A big thank you to REPs registered education provider New Zealand Institute of Health and Fitness (NZIHF) for inviting us to their Christchurch campus careers evening this week. On completing their qualification in exercise, NZIHF graduates automatically meet the qualification requirements to REPs register. 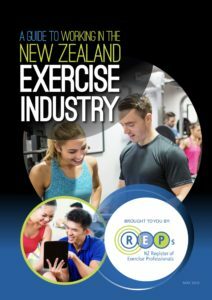 NZ Register of Exercise Professionals - REPs Exercise Association of New Zealand is inviting applications for the 2019 Exercise Industry Awards. The awards are designed to recognise those making a contribution to the health and wellness of New Zealanders through exercise and fitness. NZ Register of Exercise Professionals - REPs Former NSCA PT of the Year and fitness educator, Nick Tumminello, chats with The Fitness Industry Podcast about functional capacity and transfer. - The 5 types of client that PTs work with; science, evidence and bias; and why PTs should base their up-skilling and programming on what their clients want to achieve – not on their own personal interests. Thanks Australian Fitness Network for sharing this interview. NZ Register of Exercise Professionals - REPs Business opportunity in Rotorua for personal trainers or aspiring business owners. Chance to own your own business. Being sold by receivers as an urgent sale so chance to get a great deal. See below for full details and contact information. Exercising regularly has significant life improving and lengthening benefit at any age, from early childhood through to later years. Click below to read, and share our article. NZ Register of Exercise Professionals - REPs Research reveals that 'Inspiratory Muscle Strength Training' can boost cognitive and physical performance, as well as cardiovascular health. There is still a lot we don’t understand about how different groups experience fitness and exercise programming. A study published in the journal Disability and Rehabilitation used descriptive interview data to understand the experiences and perceived outcomes of a group-based, task-oriented exercise intervention for people with neurological conditions. Researchers interviewed 13 people, nine post-stroke and four with multiple sclerosis, and 12 of their caregivers following an exercise program that included a partnership between healthcare and recreation. The findings revealed that participants experienced a number of interrelated benefits—including improved balance, strength, and confidence linked to better everyday functioning and social engagement. Caregivers saw benefits as well as challenges. The benefits were namely around emotional health, from assisting participants and seeing their improvements. Caregivers cited time and program costs as their top challenges. Thank you IHRSA for sharing this information. A new study (26,000 participants) by The New England Journal of Medicine found they may actually prevent some conditions among people who have never had certain health problems before. Your thoughts on the findings? Obesity in childhood is associated with cardiovascular issues later in life, but healthy lifestyle changes may help prevent those outcomes. A study published in the European Journal of Applied Physiology looked at whether a jump rope program could improve cardiovascular risk factors in adolescent girls with pre-hypertension. The study included forty girls randomised to a 12-week jump rope exercise group and a control group. The results showed significant improvements in body composition, abdominal fat, systolic blood pressure, and nitrate levels (which other studies have associated with lower blood pressure). These findings suggest jump rope could be an effective intervention to improve cardiovascular health in adolescent girls at risk for high blood pressure. NZ Register of Exercise Professionals - REPs 2 Weeks left to take advantage of earlybird pricing. FitEx LITE in Christchurch is coming around fast and people are getting excited. We have had great feedback about the selection of sessions and the presenters (some of which you may know from their years of presenting at the FitEx conference held in Auckland, November each year). Andrew Chadwick, aka Chaddy, has presented at more than one FitEx and is one popular presenter. Chaddy is coming over from Australia to present 3 sessions for you and we know from his previous sessions they will be full. NZ Register of Exercise Professionals - REPs Finally Governments are Getting our Message! Exercise Association of New Zealand ultimate mission is to increase the number of people being active though exercise in New Zealand - this means more kiwis with memberships / visits / using ExerciseNZ providers. To do this, both ExerciseNZ and NZ REPs work on a number of levels including engaging with government to influence policy, and (at times) make submissions on laws that are adversely affecting our industry. We engage with both government agencies in NZ, political parties, and where relevant global bodies such as WHO and UNESCO. Recently Richard Beddie the CE of ExerciseNZ was invited to attend the World Health Organisation (WHO) global meeting of the exercise industry. While there he was asked to present on the global development of exercise professionals registration systems though ICREPs - the international Confederation of Registers for Exercise Professionals (of which NZ REPs is a founding member). The presentation was well received, with many unaware of the global standards that underpin each registration body, nor the portability of over ¼ million exercise professionals now in place globally. One thing that was quite surprising, and very concerning, is that New Zealand has one of the worst inactivity levels in the world - 13th worst in fact - and none of our major training partners (USA, UK, Australia, Canada) are anywhere close to us. The good news is that the WHO, and ExerciseNZ, and lots of providers of exercise in NZ want to do something about this - and we intend to take action. The WHO meeting was extremely productive, with the WHO likely to adopt a number of key outcomes to assist in raising global activity levels, and in the case of ExerciseNZ we will be working with both the WHO, but also various government agencies in New Zealand to develop concrete plans to increase physical activity levels in New Zealand. While very early days, by us all working together to get more physical activity using exercise in New Zealand, we CAN and WILL make a difference. ExerciseNZ is here to support you on this journey - and rest assured we will continue to bring this important issue to the attention of government at every level. The benefits of exercise for cardiovascular health are well established by the available evidence. A systematic review in the Journal of Surgical Research analysed the available data on the effects of exercise prior to surgery (prehabilitation) on outcomes in people undergoing vascular or cardiac procedures. Researchers reviewed nine studies. The findings showed an association between prehabilitation and a shorter length of stay, reduced postoperative complications, improved physical function, and improvements in self-reported health-related quality of life. More research is needed to analyse these effects on a more diverse group of patients, but these findings suggest exercising before cardiovascular or vascular procedures can be beneficial. NZ Register of Exercise Professionals - REPs Regular Exercise Can Help Parkinson's Patients at All Disease Stages, Therapist Says. Nice article reinforcing what our industry already knows. Yoga teacher registration is now live and we invite applications for registration at the new level. Please click here for further information and to access our application form. Why use a REPs registered trainer? A reminder about the importance of using a REPs Registered Exercise Professional. REPs registered trainers have the knowledge, up to date skills, and professionalism to help you reach your goals safely & effectively. REPs Small Studio from Exercise Association of NZ on Vimeo. YMCA – We are REPs Registered Exercise Professionals from Exercise Association of NZ on Vimeo. Our industry is a vibrant and ever changing one. We know that it can be hard to keep up so we work on keeping you up to date on some of the most important information through our facebook page. Click here now to follow us on facebook. The newly released Ministry of Health Going to the Gym guide recommends using REPs Registered Professionals. This is important recognition of the safe and effective exercise advice delivered by REPs Registered Trainers. REPs and Exercise New Zealand (the industry association) provided input into the development of the guidelines, which provide the public with valuable information to consider before getting started into exercise. Not sure what to look for when searching for a Personal Trainer? REPs have developed a simple guide to help you find a trainer that is the perfect fit for you. One of the key points is a simple one, when choosing a trainer or exercise facility, make sure they are registered with REPs. Using a REPs registered trainer ensures that they follow industry best practice guidelines, meet all education requirements, and continue to up-skill, and are bound by a code of ethics. Why use a REPs registered facility? YMCA Auckland & Hamilton are an excellent example of how registered exercise facilities only use registered exercise professionals. REPs Small Group Training from Exercise Association of NZ on Vimeo. YMCA – We are a REPs Registered Facility from Exercise Association of NZ on Vimeo. 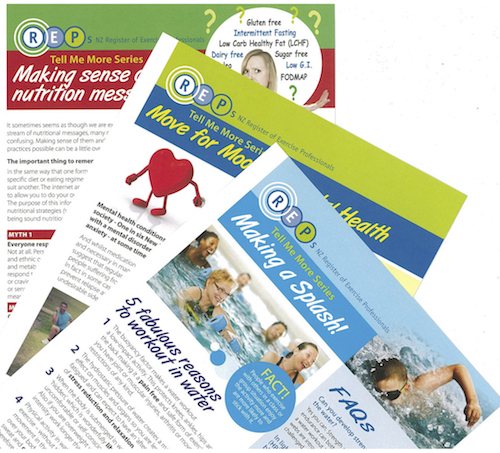 REPs releases a new Media release will helpful tips, information, scientific research and tools to help you and your clients. You can access these below. Our range of consumer info guides, the Tell Me More series continues to grow with the new addition on Mental health, Nutrition, Making a splash. These guides are an excellent resource and to be used in conjunction with a REPs registered professional/facility, so ask your trainer for your copy now. Looking to Work in the Industry? Designed for those thinking about a career in the exercise industry in New Zealand. Developed by the NZ Register of Exercise Professionals, in conjunction with the PT Council, and supported by ExerciseNZ. This is a comprehensive guide that outlines many of the factors to think about when considering a career as an exercise professional.